Throughout many semesters, all BUILD team members have participated in discussing theories of sustainable development and have attempted to devise successful and sustainable projects to be implemented in Thottiyapatti, a small village in the most rural section of Tamil Nadu, India. In a lot of ways some of the work we do at Tufts seems abstract. We are certainly introduced to Payir as well as Thottiyapatti and its members, However, it is still hard to understand an organization and community so distant to us. Being able to come to Payir and Thottiyapatti itself has provided an incredible amount of context to our projects, and faces to the names we have heard so much about. Moreover, it has also given us an energy with which to continue doing our work. One of the priorities of our trip was planning and completing health surveys in Thottiyapatti. When we conducted them with the help of Payir, we asked about toilet usage, hand washing, water boiling, knowledge about dysentery, etc. The increased severity of open defecation and dysentery has created concern for Payir healthcare personnel, thus we worked closely with Payir health workers to design a survey that aimed to understand the community’s opinions of these issues and more related to their knowledge of health and sanitation. The results of the survey have helped us to begin planning for a Health Day for the next trip that aims to address unsanitary water drinking and handwashing habits and to promote toilet usage and other healthy living habits. Additionally, we worked with the health workers to create informational health pamphlets. 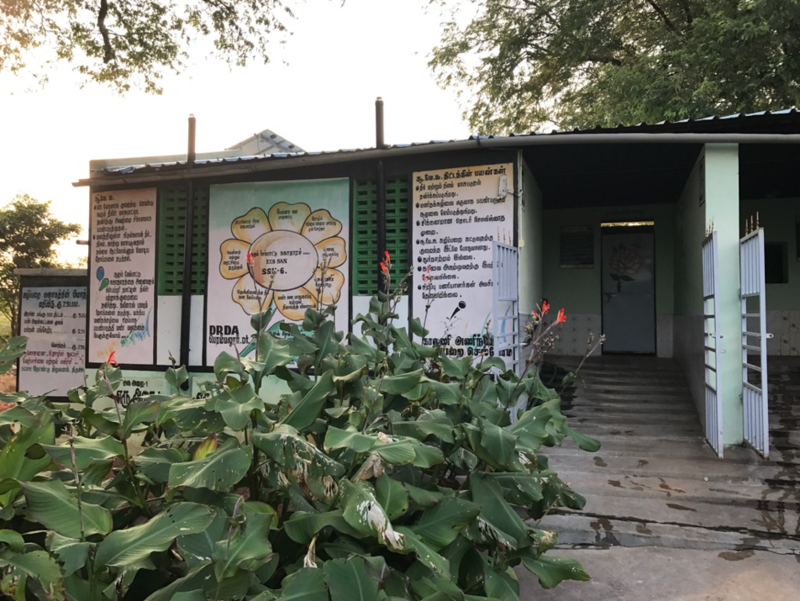 We also learned that some of the main motivations for usage of the ECOSAN toilets was due to the cleanliness of these toilets and the privacy they offered - two factors that informed ways in which we continue to promote the toilet usage. This also reassured us that the increase in individual toilets did not decrease the need for this communal toilet because of issues with taking care of septic tank waste, which has implications both in the realm of compatibility with the community member’s lives and in the realm of health concerns. Also around the time that we conducted surveys, team members accompanied Preethi (one of Payir’s directors) and Poonama (a Thottiyapatti resident who cleans the public toilet complex) to Trichy in order to form a relationship with a wholesale cleaning supply store. We also aimed to provide more sanitary tools and techniques for cleaning the toilet which Poonama does not regularly have access to (such as mops, shoes, and soap). We were provided time to talk and learn from Preethi, who has a wealth of knowledge and experience surrounding development work, as well as travel and work closely with a community member of Thottiyapatti to discuss some of the success and shortcomings of our toilet complex. Mid-way through our time there we took a trip to Perambalur, the capital of Perambalur district to meet with the district collector about funding for fixing the toilets. We brought a letter including the exact budget and reasoning for our request and presented it to him when we arrived at his office. He was very open to helping us with funding to deal with the clogging issue and agreed to give us the amount of money that we needed. He also discussed similar toilet models that had been built around the district and his hopes to implement more initiatives to increase toilet use. We also met the two new learning center teachers, Devika and Banupriya, who are local college students and residents of Thottiyapatti. We discussed ways in which we can continue to bring better quality education to the students in Thottiyapatti. In a meeting with Mr. Pachumuthu, who is a local middle school teacher and Payir worker, we also discussed ways in which we could better support the Learning Center and teachers. The two teachers are looking forward to going to a week intensive teacher training session, the same program many of the Payir school teachers have gone to. Additionally, we started planning for a Career Day at the Learning Center, which we are excited for.